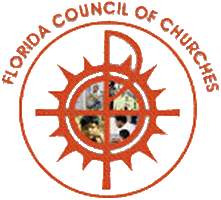 The Florida Council is a catalyst for realizing the unity which Christ has given the Church, a unity that leads to solidarity with all of humanity. At the beginning of biblical history, God calls the immigrant Abraham to become a blessing for all families upon the earth. Isaiah proclaims that all flesh shall see the salvation of God. The Apostle Paul says that Christ dies once for all. Peter declares that all who are just are acceptable in the sight of God.